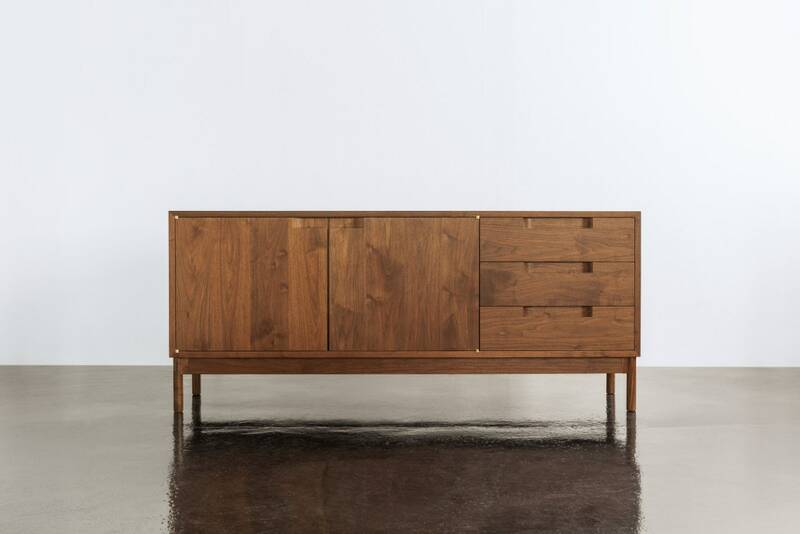 Showing subtle influences of Danish Modernist design, the Hartford Media Case – like all pieces in the Hartford Collection – foregoes flash in favor of purpose. From the choice to use flush-faced doors and three vertical drawers with integrally-cut handles that eliminate hardware, every aspect of the case’s design finds beauty in aesthetic subtraction, rather than ornamentation. Made using a range of hand-selected North American hardwoods, the Hartford Media Case conceals the technological workings of a modern entertainment suite, leaving visible only what’s necessary. The Hartford Media Case celebrates the beauty of clean, straight lines. Beginning at the floor with four legs that form a distinctive union with the supporting rail, its structure is purposeful. The case rests atop its pedestal in the form of a concise rectangle, traditionally joined at all four corners. The exterior of the Hartford Media Case frames its working area, with three flush-faced drawers, and two cupboard doors – all which work to conceal the workings of a modern entertainment center. 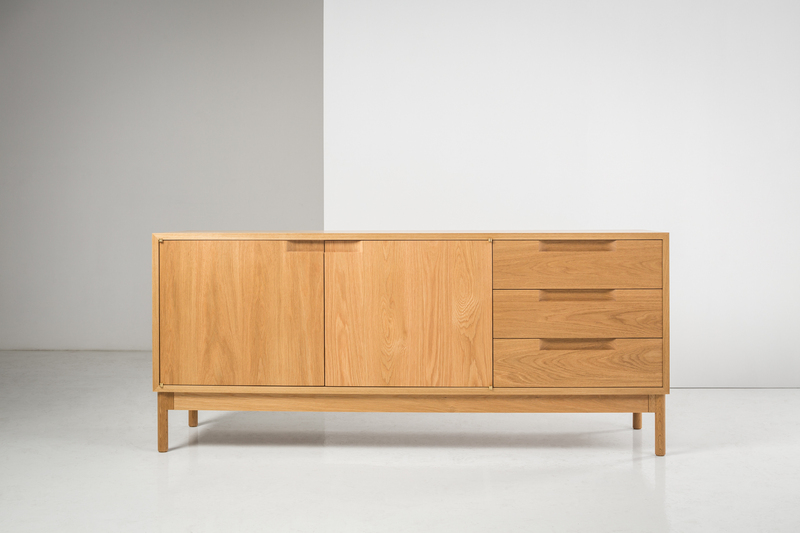 The drawers are pure Moser, nesting snug within the face of the piece, and accessible through the use of polished hardwood slides that maximize space and provide a lifetime of smooth, unfaltering performance. Doors are secured with simple, reliable brass knife hinges, and conceal adjustable interior shelves. The handles of the Hartford Media Case are also distinctive. Recessed from its front plane, they eliminate the use of ornamental hardware, while providing a firm grip for opening and closing doors and drawers. As standard, the piece comes with two wire management slots in the solid wood and framed rear panels of the doored compartments of the case. Because of its straight-forward design, the media case can be customized based on specific electronic needs, or your preference. The Hartford Media Case is an example of letting function dictate form. Designed as a case to satisfy a variety of functions with its primary use assumed to be the support of electronic components, such as internet routers, cable boxes, stereo equipment and the like, its simple design speaks to its versatility as a piece of furniture. The nuances of the case are what define it – particularly the leg to rail detail and the drawer and door pull cut-outs. 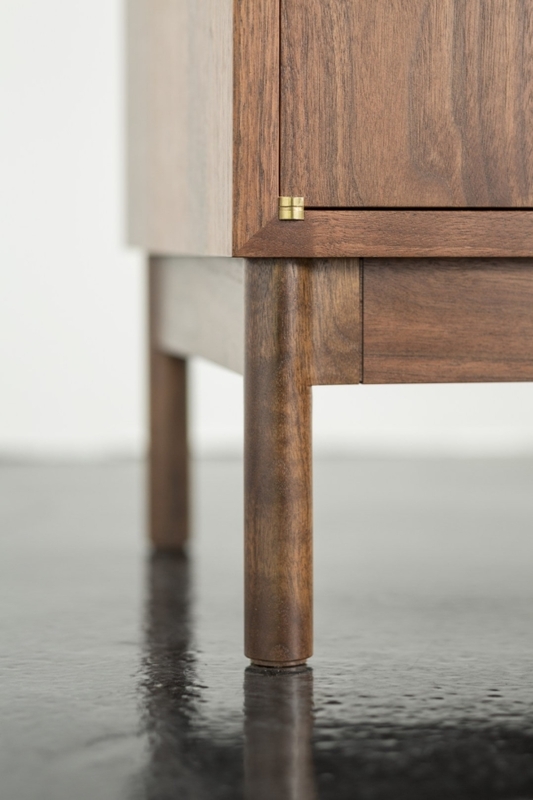 These details are consistent through the collection, thereby serving to connect it visually to its companion pieces while simultaneously helping to define its uniqueness. The left side has two doors that open to a single shelf on each side that sit on adjustable shelf pins and are hung on solid brass knife hinges. The right side has three drawers of equal size for storage. The Hartford Media Case is designed to integrate with both contemporary and traditional living ensembles. While it fits well with other pieces in the Hartford Collection, the table works in any eclectic arrangement. 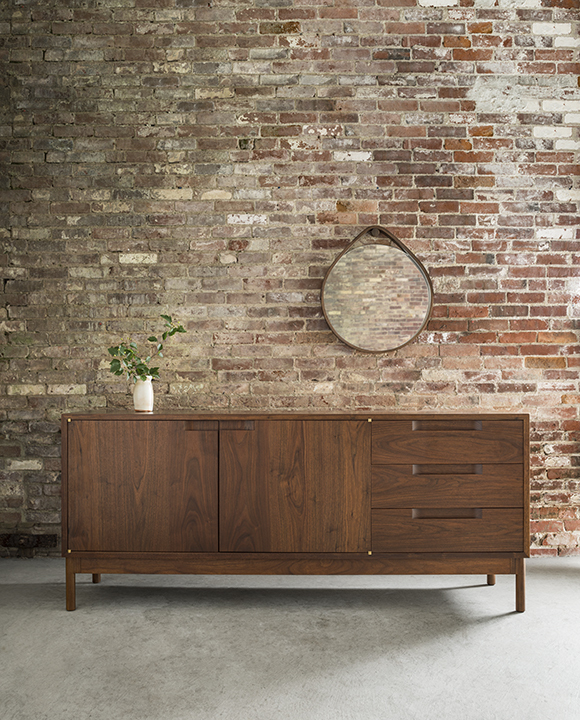 The Hartford Media Case is part of the Hartford Collection, which was recognized as an Architizer A Jury Award.